Orlando used to be the kind of place you would write punchlines about. Teeming with its notoriously naïve tourists (the ones every Orlando-an is too proud to confess truly bolster our economy), wild petty-crime headlines that induce both shame and sympathy (“Florida Man tosses alligator through Wendy’s drive-thru window, charged with assault with a deadly weapon…”), and its ancient mystical ecosystem -- the one just waiting to poison, sting, or otherwise maim you right in the very sinkhole-turned-lake you’re swimming in. I often wondered why I stayed so long. In my travels outside this place, I’ve endured the agony of countless conversations across bar-tops with strangers who are unequivocally certain that my home is little more than an industrialized swamp. To outsiders, Orlando was always an unimaginative destination. Lacking any kind of distinguished culture and with not much to offer outside of retirement home options and cheap, empty recreation, people always seemed to sneer at the place I called home. To say this attitude has shifted would be an understatement. Once the laughingstock, Orlando has now been transformed. A joke at first, Orlando became another name on the growing list of cities recited at podiums, in front of cable news cameras and undoubtedly law enforcement briefing rooms. Columbine, Virginia Tech, Fort Hood, Aurora, Sandy Hook, Charleston, San Bernardino, and now Orlando. A little more than one year ago in the face of a sweltering summer heat worsened by the divisive political theater of one hateful small man, Orlando demonstrated its humanity to the world. In the hours following the unimaginable massacre at Pulse, the people of Orlando travelled from far distances and stood single-file to donate blood and other vital supplies to the victims and agencies at the scene. Spanish-English speakers arrived to translate devastating updates of deaths and head-counts coming from the traumatized triage staff at Orlando Regional Medical Center. Donations pouring in almost instantly as the hours dragged on. The pain of not knowing who remained unaccounted for was indescribable. Orlando was not going to sit by idly. Countless memorials with words of solidarity from the Muslim community and the world at large set the scene for the many thousands-strong vigils. Attendees swathed in the Puerto Rican, Cuban, and LGBTQIA flags gathered to stand together in their heartache. It was a period of mourning and moments of deafening silence. Soon after, Barack came to lay down white lilies and grieve again -- a task he was all too familiar with by now. That Sunday night, while accepting his Tony award, Lin Manuel reminded us that love is love is love is love and the world watched as Orlando put itself back together. I often reflect back on what was stolen from us on that night, the list of 49 names inescapable. Lives were taken, virtuousness, integrity and the decency of being safe in your own neighborhood compromised and our sunshine drenched community wounded. A few weeks after the waves of grief and shock subsided, fleeting moments of hope occurred. 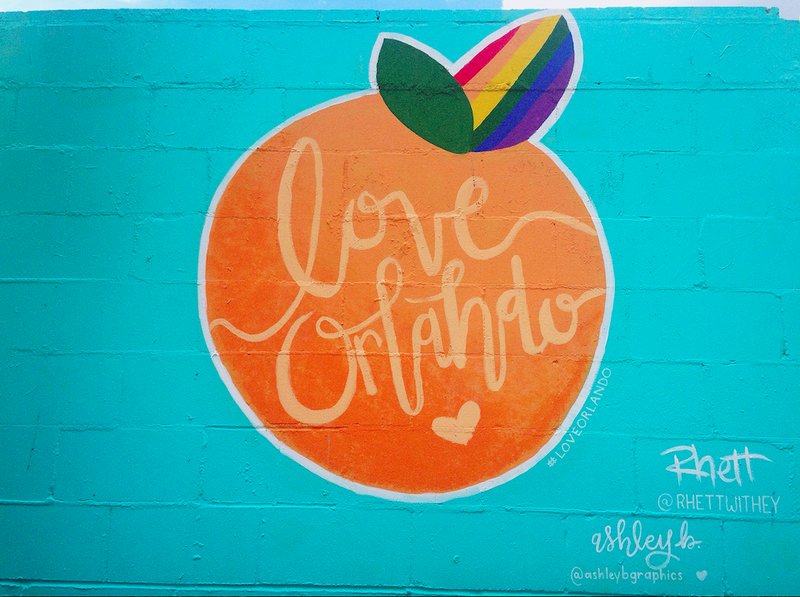 Like many of the people here, I was not ready to acknowledge that time would soldier on despite this attack but over time the murals and other art installations that popped up around the city gave rise to a new Orlando: an inclusive supportive place that presented proudly it’s rainbow colors and intolerance of bigotry. The blocks in my downtown neighborhood decorated with flags never hung there before, people confidently wearing symbols or solidarity on their chests, streetlight posts with rainbow banners freshly hung by the city bolstered our unity. As Election Day crept nearer, these became important symbols of our progress and reminded me of the fierce urgency of now -- to not take that tranquilizing drug of gradualism. Though the sanctuary that Pulse provided had now closed its doors for good, the refuge it stood for outgrew its physical location and now reaches beyond the city itself and our rainbow leafed Orange ever guiding us always towards justice. After Pulse, the LGBTQIA flag was raised in Orlando’s City hall for the first time in its history. Patty Sheehan, Orlando's first openly gay City Commissioner received the recognition and funding for the activist organizations she has been dedicated to for so long. The city joined the “Safe-Place” initiative to deter hate crimes and financial donations were raised to fully cover the financial burden on the survivors and victim’s families. By summer’s end, there was finally a national spotlight on the need to protect the lives and safety those who exist in the intersection of sexual orientation, gender identity, and race. Somos Orlando. We are all Orlando. And just as I felt assured relief was coming, Election Day happened. Many of us re-lived the pain and fear all over again, the unknowing. I was certain none of our progress made any difference. I was sure all of it was for naught. All of this was for nothing! Uncertain and full of doubt, I remained defeated until January 21st 2017. It’s now been over a year of marching in Washington and rallying at home. A year of pounding feet on pavement, of voices booming through megaphones, countless homemade signs and of fists waving proudly in the air – Orlando has been hard at work. Recently, the city (in a not soon enough effort) removed a confederate soldier statue that sat opposite the newly rainbowed Lake Eola amphitheater and relocated it to a nearby cemetery. While this was initially met with what can only be described as deplorable protests, I am steadfast that the future is soon arriving. My days in Orlando are now numbered as I move wide-eyed towards a new life in New York City, but the irony is not lost on me. I was leaving this place because its ideals never matched my own. As I make that new life a reality, I am happy to report that the tides are changing here. These are the streets I marched on for Black lives and women’s rights, for equality, immigrant rights, and environmentalism, and justice. As I pack my bags, I see now more than ever, the gains from our demanding work. As Orlando inches towards a better future, I leave my home feeling the Resistance gaining strength and I will look back with pride and unyielding hope. Join us, endure, persist and without ceasing, resist.